As far as tough-as-nails full-size trucks go, the RAM 1500 is the proverbial king of the mountain. Find your rugged RAM 1500 at Palestine CDJR FIAT today. Any job worth doing is worth doing the right way. That’s where your new RAM 1500 comes in. Whether it’s work or play, your RAM 1500 is well equipped to take care of business. Get behind the wheel of your ideal RAM 1500 truck with the RAM Truck team at Palestine CDJR FIAT. There’s a reason why RAM trucks are the most dependable full-size pickups on the road today. That’s because the RAM 1500 was built to last, and to keep on keeping on in terms of toughness and capability. Do you have a need to haul and tow some serious loads? No sweat. The RAM 1500 can tow up to 10,620lbs without flinching. It can also hold a payload of up to 1,880lbs, giving you the flexibility you need to tackle every task with total tenacity. Once you climb up in the cabin and lay your hands on the wheel, you’ll feel more eager and ready than ever to command the pure power and possibilities of the RAM 1500. That includes some incredible technology and convenience features, as well. The Uconnect 8.4-inch touchscreen display Infotainment System allows you to maintain full control of your RAM 1500. You can make and receive phone calls, send and receive text messages on your compatible device with the sound of your voice via Bluetooth technology. Get there on time and without confusion with an Integrated Navigation System, featuring real-time traffic updates and 3D maps to keep you up to date and on the best route. For a bit of entertainment, take advantage of the RAM 1500’s ability to stream music, HD Radio, or SiriusXM Satellite Radio. 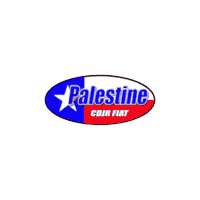 Check it all out firsthand with the dedicated team at Palestine CDJR FIAT. The central purpose of the RAM 1500 is to make life easier. That includes some welcome convenience features that you’ll come to rely on. In fact, you might even wonder how you ever got along without them. The RAMBOX Cargo Management System gives you more space in the bed of your truck to secure your tools without keeping track of another set of keys. The Cargo Bed Extender and Divider will maximize your ability to organize your toys and to keep them all secure while you’re out and about. You can also customize the RAM 1500’s Driver Digital Information Cluster to display the info you need to see. You’re looking to own the ultra-capable RAM 1500, and we have a fantastic selection IN STOCK. Check them out online now, and contact us with your questions. We’re here to facilitate all your needs and put you behind the wheel of your ideal RAM 1500 on your terms, not ours. See the Palestine difference firsthand when you stop in to take a ride in the incredible RAM 1500.